Perhaps more than any other kind of vehicle, motorcycles embody the American spirit. Motorcyclists come from all sorts of backgrounds, from the construction worker who rides a motorcycle on a daily commute to work, to the surgeon who jumps on a motorcycle on the weekend as a way to relax and unwind. Unfortunately, motorcycles are a dangerous way to travel compared to cars and trucks. Without the structure of steel and aluminum around their bodies, motorcyclists are incredibly vulnerable in a crash. In most cases, their injuries are catastrophic. In the most tragic cases, a motorcyclists dies due to a motor vehicle collision. At Mesirow & Associates, PLLC, we have a reputation for helping motorcyclists throughout Metro D.C. and the surrounding areas. In a city as congested as Washington, D.C., motorcycles are a popular mode of travel. We fight hard for our clients, and we work tirelessly to get them the compensation they need to get back on their feet and back on the road. Although there are more car accidents overall, motorcycle accidents have higher fatality rates compared to accidents involving cars. In 2014, motorcyclists were 27 times more likely to die in a crash than car occupants. Motorcyclists were also five times more likely to be injured compared to people involved in a car crash. The human body is no match for a car or truck, which means that motorcyclists rarely walk away from a crash unscathed. In fact, the National Highway Traffic Safety Administration states that 80 percent of all motorcycle accidents result in injuries or death to the motorcyclist. In recent years, researchers have also noted that motorcycle injuries and fatalities among older riders are on the rise. According to one study, motorcyclists over the age of 60 are three times more likely to be seriously hurt in a collision compared to younger riders. As we age, the human body simply isn’t as resilient. It is also more difficult to recover from injuries as an older person. In a crash, the impact of colliding with a car or the road can cause devastating injuries in someone over age 60. If you or a loved one has been injured in a motorcycle accident, don’t wait to speak to an experienced lawyer about your case. 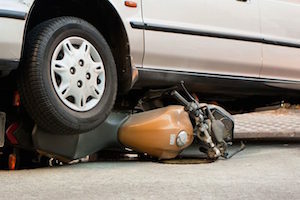 The Washington, D.C. motorcycle accident lawyers at Mesirow & Associates, PLLC have helped people just like you get justice and compensation for their injuries. Talk to a lawyer today by calling 866-463-0303.